The most enjoyable aspect was being on site and being able to see everything you do in the office actually be carried out in practice. Katie won the University's Women in the Built Environment Award and a 10 week internship working with Gleeds in London. 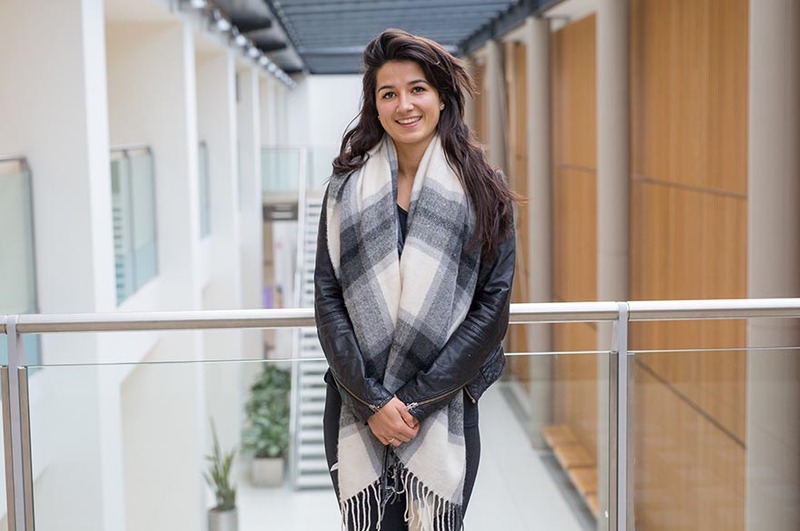 “The thing I enjoy most about my course is the diversity of topics we study and how realistically its taught. It hugely helped me with my placement! “The lecturers are awesome on our course, they know our names already and it’s a really friendly atmosphere. They always reply to my emails promptly and always make time to see me if I need extra help. “We went to Leicester for the day as part of our construction module. We went to a housing site so that everything we were learning in our module we could see in real life, it hugely helped with the exam. We are going to Berlin this year for a week on my course, which I cannot wait for. “During my 10 week summer internship with Gleeds I worked with the education team delivering schools projects across the UK. The summer is a busy time at Gleeds in the education team as we were working towards getting the schools open by September. It was a great team to work for as I was able to see the full delivery of projects. In my second week I was at site, by my third week I was writing gaps list for contracts, conforming and sending out payment notices, writing and requesting fee proposals, writing feasibility studies, reviewing sites, and the planning portal and much more. It was a great summer, with amazing people and I learnt a huge amount. What was the most enjoyable aspect of this internship? “The most enjoyable aspect was being on site and being able to see everything you do in the office actually be carried out in practice. “The skills I have gained is organisation and time management especially – I had a lot of work to do and there was no chance I could have completed it all if I had not been organised and watching the clock. What advice would you give to prospective students considering applying for your course?